Undeniably rechargeable blower vacuums offer a clean job. It gives you the chance to say bye to fumes while cleaning your garden. With the innovative technology, you can use your blower early in the morning and still let your neighbor sleep undisturbed. Just snap in the battery and you are ready to begin your job. The Greenworks 24312 is one such blower/vacuum. Furthermore, it has also the variable speed. Besides the Greenworks 24312 sweeps both the dry and wet leaves. Brushless motor; the blower/vac is powered by a brushless motor which translates into a longer lifespan for the machine. The powerful brushless motor offers 80% longevity and 30% more torque as compared to the ordinary motors. Convenient to use; the Greenworks 24312 employs the unique designs thus giving less noise and vibrations compared to gas powered blowers. Thus it presents to you a very comfortable blowing experience. The low noise production means less distraction to your neighbors. Variable speed; the changeable speed allows you to direct the direction of the intensity of the air flow. That allows you to choose the speed that suits your cleaning surface; depending on whether you are sweeping dry or wet leaves. The peak speed is 185 mph and air flow 340 CFM. Prolonged lithium battery life; with the G-MAX battery capacity of 40V 4mah, at a single charge, you have approximately 30 minutes of runtime. That gives you a lot of time to collect at least 4 bags of leaves or debris. Battery indicator; the battery monitor will help you keep the check on the available power. That helps you to approximate the remaining runtime, and thus avoid an unexpected shut down on account of low power. The blower/vacuum is more efficient on dry leaves than wet ones. 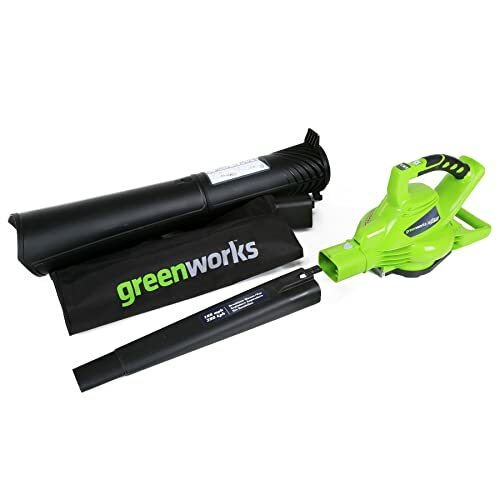 The Greenworks 24312 40V 185 MPH promises to take your vacuuming or blowing job to the next level. It produces no smoke, less noise, and vibrations. Moreover with the need of the cord negated and when you factor in the lightweight design, your operation is not limited to a fixed radius. Its benefits far outweigh the limitations.